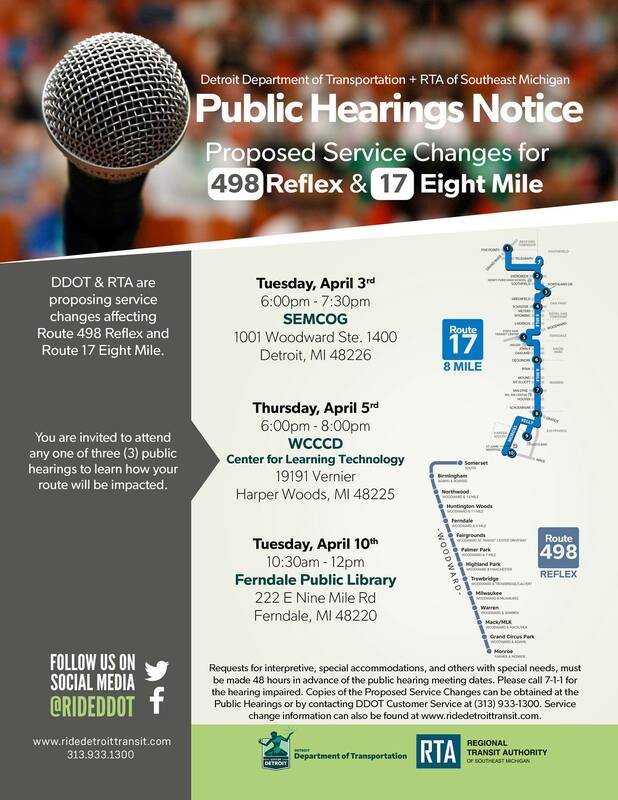 Attention Ferndale transit riders, DDOT (Detroit Department of Transportation) and RTA (Regional Transit Authority are holding 3 public hearings in April for proposed changes to Route 498 Reflex and Route 17 Eight Mile. These are formal hearings where riders and community members can hear the proposed changes and give statements before changes are finalized. One public hearing will be held on Tuesday, April 10th from 10:30am-12pm at the Ferndale Area District Library (222 E. Nine Mile Rd, Ferndale MI 48220). Find out more details at http://www.detroitmi.gov/ddot .